In the Atlantic Ocean: Tropical Storm Florence is located about 895 mi…1440 km wnw of the southernmost Cabo Verde Islands with maximum sustained winds…60 mph…95 km/h. Present movement…wnw or 285 degrees at 16 mph…26 km/h. Potential Tropical Cyclone Seven is located about 5 mi…5 km w of Key Largo Florida and about 35 mi…60 km e of Cape Sable Florida with maximum sustained winds…35 mph…55 km/h. Present movement…wnw or 300 degrees at 16 mph…26 km/h. In the Eastern Pacific Ocean: Hurricane Norman is located about 1335 mi…2150 km e of Hilo Hawaii with maximum sustained winds…125 mph…205 km/h. Present movement…wnw or 285 degrees at 20 mph…31 km/h. Tropical Storm Olivia is located about 490 mi…785 km sw of the southern tip of Baja California with maximum sustained winds…45 mph…75 km/h. Present movement…w or 280 degrees at 7 mph…11 km/h. In the Western Pacific Ocean: Typhoon 25w (Jebi), located approximately 257 nm east-northeast of Kadena AFB, Japan, is tracking north-northwestward at 11 knots. 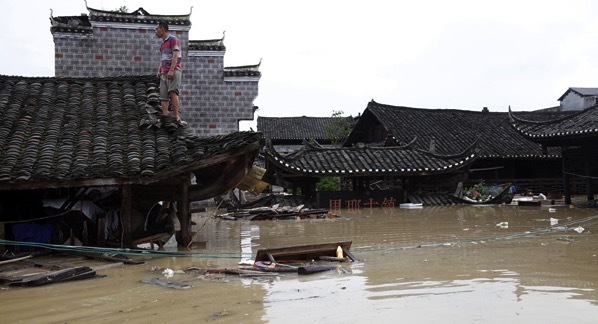 China – Five people have died and another 16 have gone missing as a result of a flood in the Chinese southeastern county of Malipo that hit the region on Sunday, local authorities said. The floods were caused by torrential rains that started in the county on Saturday night. According to the authorities, another five people have been injured during the floods. As a result of the disaster, electricity supplies and road traffic were disrupted, a number of houses collapsed and roads subsided.